I'm a simple scrapbooker, always have been. 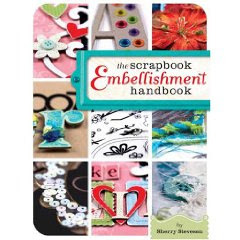 I consider myself embellishment challenged so I was very eager to check out Sherry Steveson's latest book "The Scrapbook Embellishment Handbook". 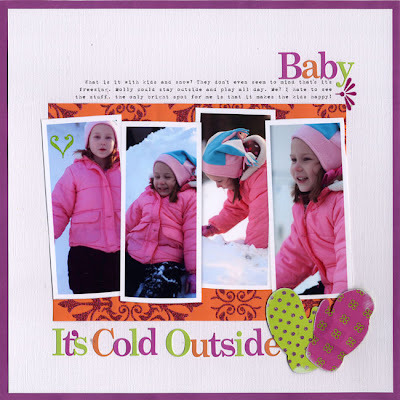 It is full of ideas and examples of how to use the 17 most popular types of embellishments. Each type of embellishment has its own chapter, alphabetically listed so you know to which section of the book to look in without even checking in the table of contents -- it sounds like a little thing but I liked the consistency of that. The chapters contain multiple examples and a couple of how-tos per embellishment. I can definitely see myself going back over and over again when I'm stuck for ideas. It's a hardback book AND it's spiral bound, a huge bonus for someone who plans on referring to it often (no cracking spine with pages falling out for this book!). 1. That spiral binding I just mentioned. So practical! 2. By far my favorite section in the book was at the end -- Step It Up to Extraordinary Layouts. 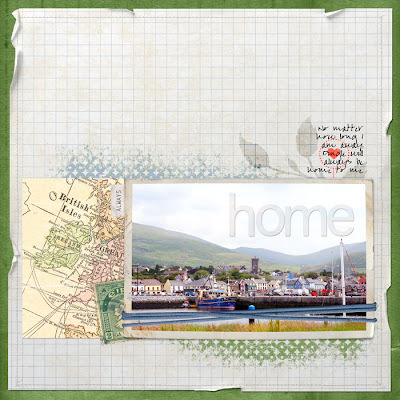 There is a gallery of layouts that show how you can take a simple layout, add some embellishments (and paper) to take the layout to kick it up a notch, or several! 3. The wide-variety of examples that are included for each embellishment. The contributors to this book are incredibly creative and I was very impressed with so many of the ideas. 1. Each layout in the gallery at the end of the book where the simple layouts are "stepped up", includes steps from two contributors. In some cases only the first and last steps are shown, presumably a space issue -- I'd like to have seen the interim steps. Give me even more of the good stuff! 2. There are some amazing card makers among the contributors to this book. I'd love to have seen some more card examples included. There were some cards though. 3. And I'm stuck. I can't come up with another negative. It's a good book! I've got a vast collection of buttons in my stash. 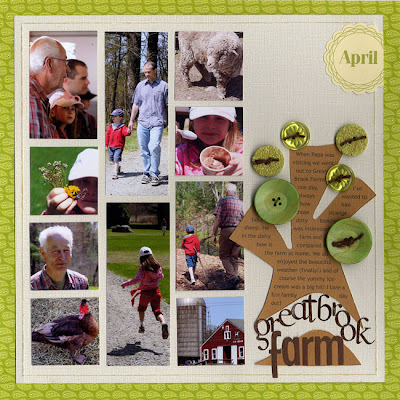 I was inspired by the ideas on page 27 to be creative with them and used a bunch of green buttons as the leaves on my tree here. I even threaded them with twine instead of thread. I was so impressed with how Juli VanValkinburg made her photo and title pop on page 39 that I decided to try a similar technique, except that I implemented it digitally. I think I achieved the desired effect. Supplies: Jelly Alpha by Michelle Martin; Photowraps no1, Vintage Frames no7, Loosely Labeled Dates, Vintage Postage, Love Grows brushes No3, Little Forest Friends brushes, Roughed Up Maps, Spot Dot brushes, Mailroom paper pack and Notebook paper pack by Katie Pertiet; Tattered 'n Torn no4 and Stitched by Anna Cream by Anna Aspnes. All from designerdigitals.com. And finally, my favorite layout. This one was inspired by the section on altering diecuts. I cut mittens using my Making Memories Slice (Falala cartridge) and popped one up using Piggy Tales pig tales. It's not quite as visible here but it adds a fun dimension to the layout. Do you have any additional ideas on how to use your embellishments? Have you read this book and what did you think? I will have to keep a look out for the book. You are right about being stuck for embellishment use when you are a simple scrapper. beautiful projects! i will be keeping an eye out for that book! Thanks for the great review! I have just ordered the book! adorable example layouts! i haven't read this, but would love to. Beautiful examples! I love your pages so clean and fun! I loved Sherry's first book so I'm sure that I'll love this one too! She's a great author! Thanks for the "heads up" on this book! I love embellishments and may have to check this one out!